Looks imposing, doesn’t it? That’s probably because this is a creation of one of the most important architect of our age, Jean Nouvel. The building is located at 53 West 53rd Street, and it represents the collection of some of the most sought-after residential properties of today’s property-saturated market. I must add that the photo of that massive door doesn’t do it justice. It’s truly imposing when you see it in person: it’s huge and is taller than ceilings in some less luxurious Manhattan apartments. 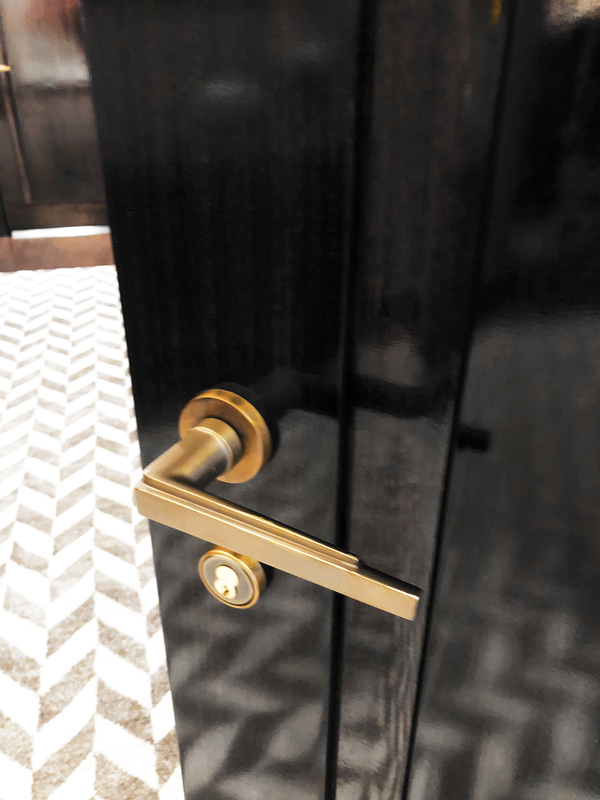 And did you notice that the brass door handle is designed to resemble the shape of the building itself? But allow me to start from the beginning! In the world of architecture, just mentioning the name Jean Nouvel has a way of making people pay attention. If you can think of a major award, the French architect has almost certainly won it. He won the coveted Aga Khan Award for Architecture for his work designing the Institut du Monde Arabe in France. He was awarded the Wolf Prize in Arts in 2005. In 2008, he won the Pritzker Architecture Prize, often referred to as the Nobel Prize of architecture, for Torre Glòries (formerly Torre Agbar), the cylindrical tower rising above Barcelona. While most of his work is in France, Nouvel has created stunning designs that truly stand out across the world, including Galeries Lafayette in Berlin, Lucerne Culture and Congress Centre in Switzerland, KölnTurm in Cologne, Copenhagen Concert Hall in Denmark, Burj Doha in Dubai, and Dentsu Building in Tokyo. Nouvel’s work finally touched down in America in 2006 with the completion of the Guthrie Theater in Minneapolis. An exciting feature of the structure is the large exterior panels which display photographs from previous plays at night. From there, Nouvel finally arrived in New York City. In 2008, he designed 40 Mercer Street Residences, a collection of luxury homes inside a sleek glass exterior. A year later, the residential tower 100 Eleventh Avenue rose 23 stories high. Nouvel describes the structure as “a vision machine,” referring to the pixelated curtain wall system that was inspired by the eye of an insect. Nouvel returned to Europe, the Middle East, and Asia for the next few years but the pull to design the future of New York City was perhaps too much to ignore. 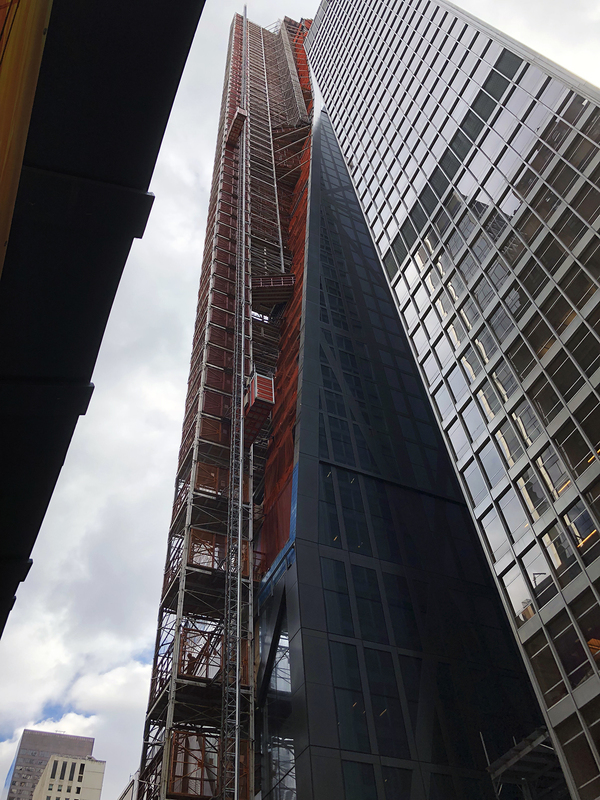 Construction began in 2014 on an 82-story skyscraper at 53 West 53rd Street. 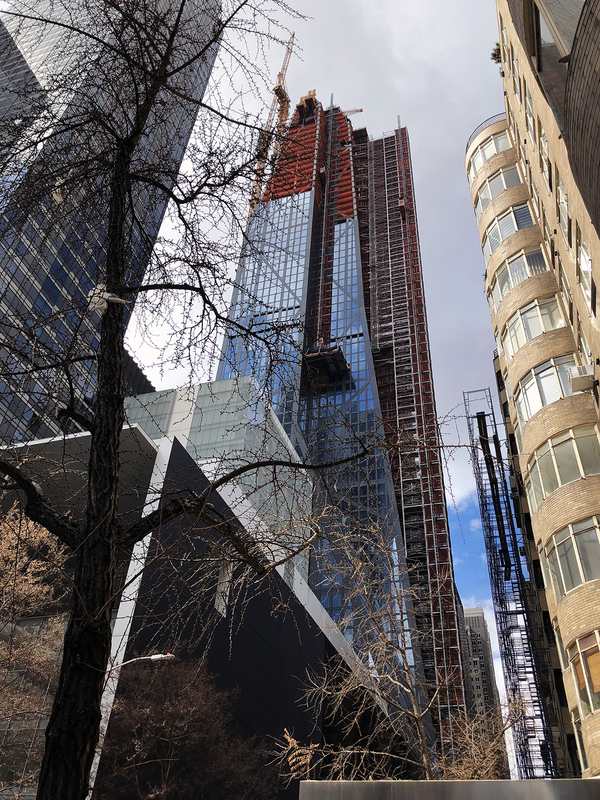 While the name has evolved over time, from Tower Verre to MoMA Expansion Tower, it is now known simply as 53W53, though there’s nothing simple about this building. The triangular design of the skyscraper is influenced in large part by the constraints that were imposed upon it. Nouvel leaned into the multiple setback requirements that the city had rather than fighting against them. He coupled that line of thinking with the diagrid system that creates an angular rhythm up the length of the building as well as into each and every residence. The system not only creates safety by bracing the structure for seismic and wind concerns but also creates a visually stunning aesthetic all the way up. The crystalline peaks atop the tower complete this balance of practicality and artistry. 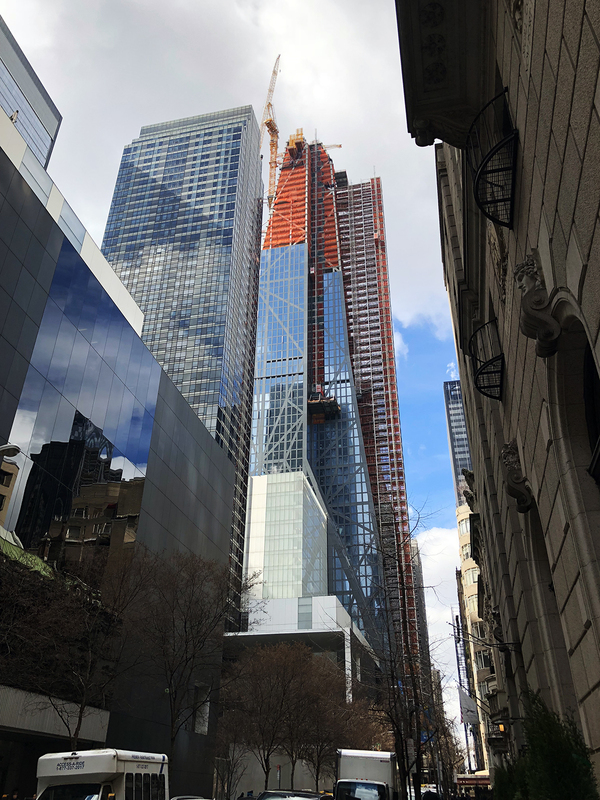 The mixed-use tower will eventually top out at 1,050 feet with an antenna spire high above Manhattan where it will become a fixture in the iconic skyline. The building itself will be 82 stories high. Scattered throughout will be 145 condominiums that range anywhere from one to five bedrooms, including a top floor duplex penthouse. All of the requisite amenities that come included with New York City luxury living will also be found throughout. 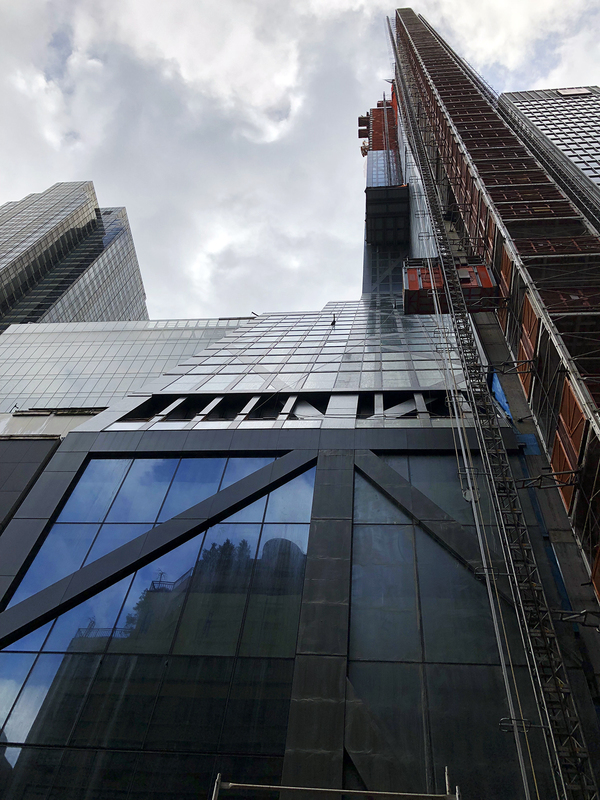 The tower will also have its own restaurant, lounge, state-of-the-art theater, and gallery space connected to the neighboring MoMA. Whereas Jean Nouvel provided the vision for the exterior of 53W53, Thierry Despont is the visionary when it comes to interiors. Perhaps best known in New York City as associate architect for the Centennial restoration of the Statue of Liberty, Despont and his firm have also worked on high-profile projects such as New York’s Carlyle Hotel, London’s The Dorchester, and Florida’s Boca Raton Resort & Club. He’s also designed the personal residences of people like Bill Gates and Calvin Klein. 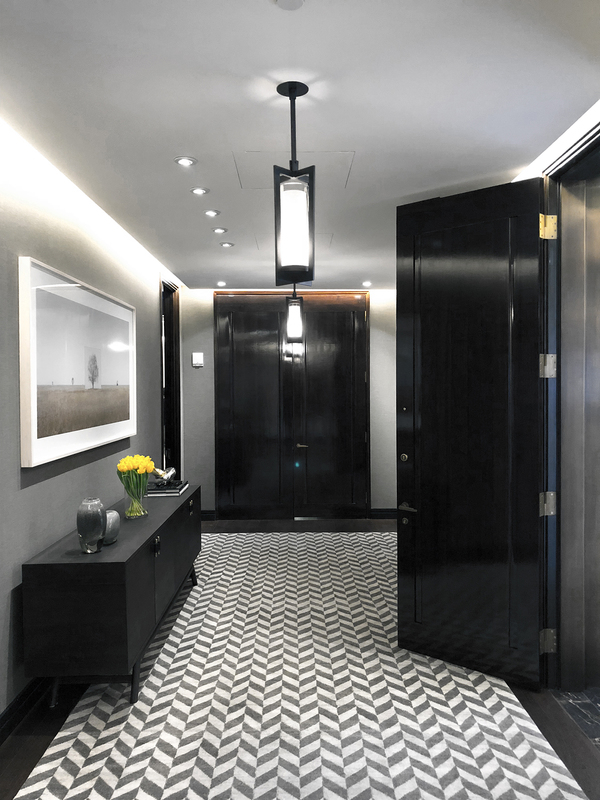 You enter 53W53 residences through Oversized walnut doors and stand under custom tray and cove ceilings while standing on solid American oak floors. You’ll be sure to notice the custom crown molding and custom wood baseboards throughout but only so long until you find yourself gazing out the triple-glazed, floor-to-ceiling windows where stunning views of the city and river await. Each window is fitted with motorized Lutron solar shades while bedroom windows come with blackout shades. Residences are all constructed with horizontal and vertical sound attenuation in order to maintain acoustic privacy between one another. Main living areas include individual thermostat controls while humidified and filtered fresh air are controlled by an automated system. Kitchens boast custom back-painted glass cabinetry with polished nickel details. Marble countertops and islands shine while the backlit marble backsplash completes the motif. Each one is stocked with a Sub-Zero refrigerator, Sub-Zero wine fridge, Miele oven, Miele dishwasher, Julien Urban Edge sink, and InSinkErator garbage disposal. Select residences also include GE Microwave ovens. The luxury doesn’t stop in the bathrooms, where Verona limestone floor and baseboards feature a honed finish. You’ll be surrounded by Noir St. Laurent marble walls as you soak in a Lefroy Brooks cast iron tub with Verona limestone surround and LED cove lighting. Carved Verona limestone vanity sinks, Villeroy & Boch wall-hung commodes, and radiated heat floors complete the package. 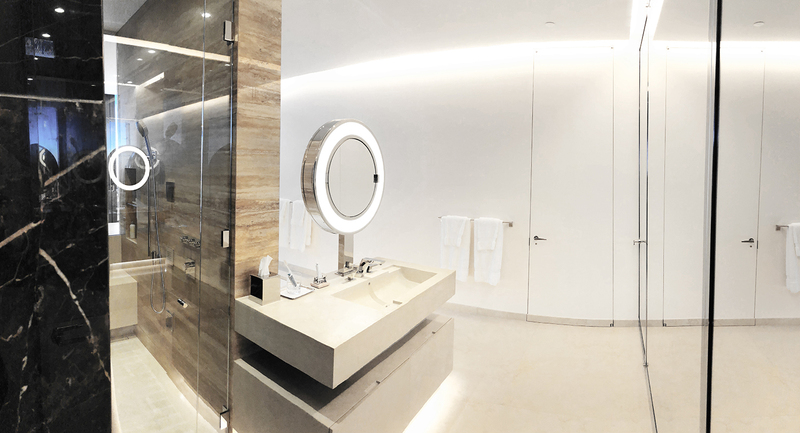 Select residences may also include steam showers, Villeroy & Boch wall-hung bidets, and Despont-designed polished nickel automated mirrors. There are so many services available to residents of 53W53 that it’s almost impossible to list them all, but we will try. 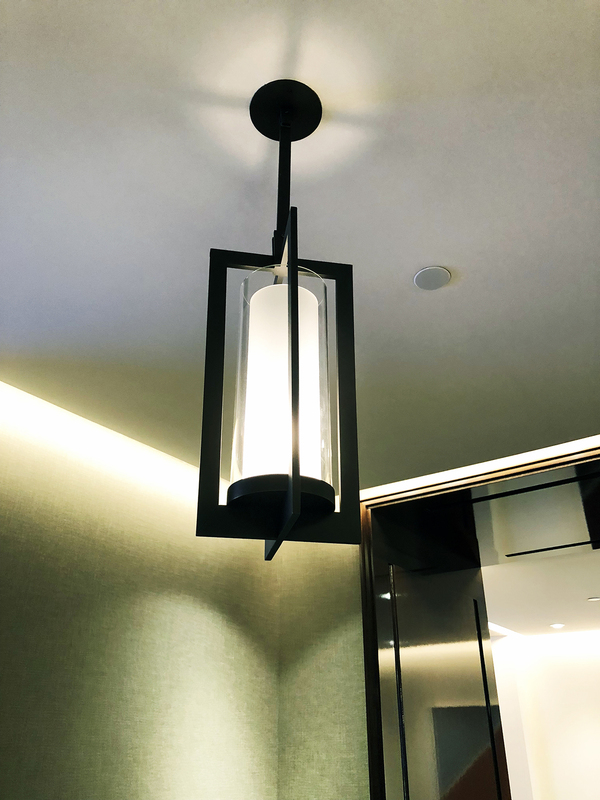 Standard services that come with residency include 24-hour concierge, 24-hour porter service, 24-hour doorman entry at both the 53rd Street and 54th Street entrances, access to a live-in resident manager, and private service and delivery entrance with dedicated staff. Extra services that residents can add on depending on their needs include a pantry-stocking service, housekeeping and maid service, dry cleaning and laundry service, floral delivery, curbside valet parking, pet walking and grooming, and access to a tech consultant who can help with computer and international phone issues. Residents can also add the ability to get priority reservations or in-residence dining from the in-building restaurant. One of the truly special amenities that come with living in 53W53 has to be the Benefactor W53 MoMA membership that comes with each residence. That gives every resident unlimited free admission to the museum, exhibition previews, MoMA store discounts, film screening access, and special curated opportunities. Building residents will also have the ability to host private events in the museum’s sculpture garden. The Thierry Despont impact isn’t relegated to residences. He also designed the oak wall-paneled lobby boasting beautiful Noir St. Laurent marble inlays and coffered ceilings, which is connected to a library complete with furniture and a fireplace. He also designed a Central Park view lounge on the 46th floor where resident members can relax, socialize, and entertain. You also can’t forget the wine tasting room he designed with leather and bronze accents to contrast a cork flooring. Enjoy the tasting area surrounded by temperature-controlled wine vaults. Some of the other can’t-miss amenities include a 16-seat movie theater, 15,000 square foot Wellness Center with sauna, steam, and massage rooms, squash court, golf simulator, and children’s playroom. There’s also 65-foot lap pool surrounded by “vertical gardens” designed by French landscape designer Patrick Blanc. There’s so much going on inside 53W53 you might almost forget everything going on near the building. The Midtown location puts residents right in the heart of Manhattan where everything you might need is a short walk or cab ride away. Located five blocks south of Central Park, 53W53 is also just one block off of 5th Avenue’s luxury shopping core. Head in any direction and you’re sure to run into a notable restaurant, such as Nobu or The Russian Tea Room, or a cultural landmark like Carnegie Hall or Rockefeller Center. You would be hard-pressed to find a luxury lifestyle that could live up to what 53W53 has to offer inside and out in Midtown Manhattan. With only so many residences still available, there’s no time like the present to see it for yourself. Sales have been ongoing for 53W53 since September 2015 but 15 residences still remain available. Even though there are only so many units to go around, there’s still a wide selection of availability to choose from. A 1,619 square-foot, one-bedroom unit on the 24 floor with eastern exposure asks $3,645,000. Meanwhile, you can find a 2,029 square-foot, two-bedroom on the 29th floor with eastern and southern views for $6,350,000. The highest-up available residence, a 6,954 square-foot, four-bedroom condo with 360-degree views is asking $42,500,000. Of course, a project like 53W53 doesn’t get made on design and amenities alone. The development’s stakeholders have helped to guide it and allowed for Nouvel’s vision to take shape. They include Hines, the privately held real estate firm founded by Gerald D. Hines, which is no stranger to collaborating with talented architects such as Cesar Pelli, Richard Meier, and Frank Gehry. Pontiac Land Group, a Singapore-based luxury real estate development company, and Goldman Sachs Group, one of the leading global investment banking and management firms, are both development partners along with Hines on the project. Corcoran Sunshine Marketing Group, an industry leader in luxury residential marketing and planning, is handling sales for 53W53.